Pride Center's Sarina Loeb with the LGBT Heritage Month City Hall Recognition recipients and city council. Photo courtesy of Sarina Loeb. Sarina Loeb with Sarina Loeb with her parents, mother Abby Loeb and step-dad Dr. Bruce Figoten at the LGBT Heritage Month recognition in May 2018. Photo courtesy of Council-member Englander. 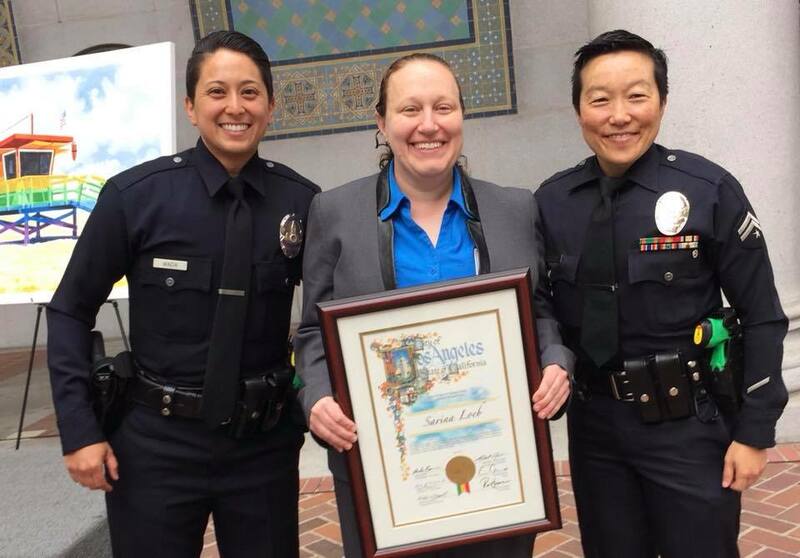 Sarina Loeb with her award standing with the LAPD LGBTQ Liaisons at the LGBT Heritage Month at City Hall. Photo courtesy of Sarina Loeb. When Sarina Loeb ’13 (M.S., College Counseling Student Services) was a graduate student at California State University, Northridge, one of her goals was to run a lesbian, gay, bisexual, transgender and queer (LGBTQ) resource center. She fulfilled that goal in 2012, becoming the first coordinator of CSUN’s Pride Center when it opened that year. Loeb was the perfect fit to run the Pride Center because of her passion and dedication for the LGBTQ community. “It’s a dream come true — to be able to give back to my community is unbelievable, and work at the campus I have my degree from, that I am an alum of, is amazing,” Loeb said. Loeb grew up in the San Fernando Valley and knew she wanted to educate people about the LGBTQ community and advocate for their needs, she said. She came out as queer her sophomore year in college, when there were few resources for queer people and no LGBTQ center at her university. Loeb takes pride in her work, helping to fill that void and making CSUN’s Pride Center an inclusive place to just “be you” on campus, she said. 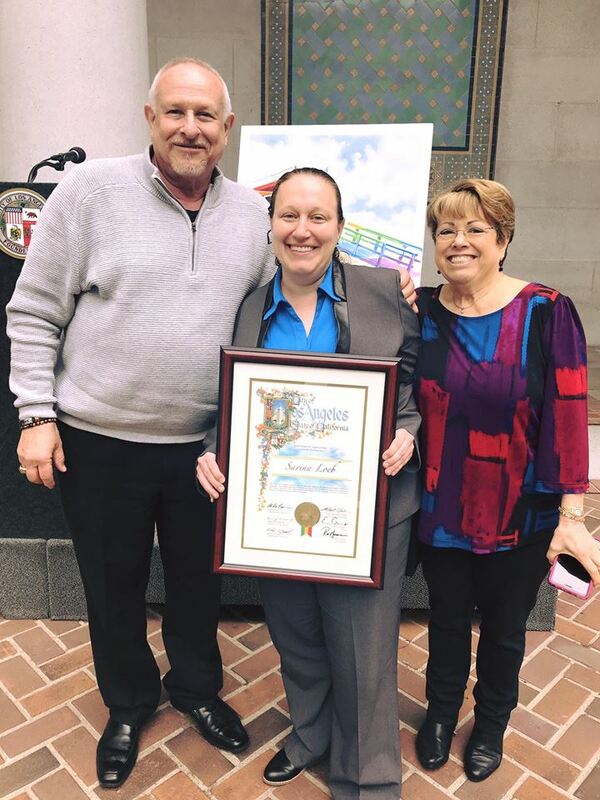 Her efforts recently were recognized by Los Angeles City Councilmember Mitchell Englander, who in May named Loeb the LGBT Heritage Month honoree for LA’s 12th District. “It is an honor to be recognized for this achievement and for the Pride Center to be recognized. My recognition would not be possible without the hard work of my team of students who work at the Pride Center and the support of the University Student Union,” Loeb said. Loeb was invited to the city’s LGBT Heritage Month opening ceremony to accept her award, and Englander tweeted about his appreciation for her work and passion for the Pride Center and LGBTQ community. “On behalf of my office and the City of Los Angeles, we commend Sarina on her dedication to our residents and thank her for her deep involvement in LGBTQ student organizations and initiatives that continually strengthen CSUN and our community,” Englander tweeted. While working on her master’s degree in college counseling in CSUN’s Michael D. Eisner College of Education, Loeb met University Student Union Executive Director Debra Hammond, who soon became a mentor. After completing her master’s degree, Loeb told Hammond about her desire to work with the LGBTQ community. Hammond recognized that Loeb was a perfect candidate to advocate for the needs of CSUN students, in particular LGBTQ students. “The first day the doors opened to the Pride Center, to see the students coming into the space and hanging out and utilizing the services was a dream come true,” Loeb said. Since the center’s opening in 2012, Loeb has advocated on behalf of CSUN students and hosted LGBTQ inclusivity workshops for faculty and staff across campus. She also has trained students as peer mentors, to offer support to LGBTQ students who come to the center.